Peru has recently been shown to have been home to one of the oldest monument building cultures in South America. The valleys of the Norte Chico region have revealed cities with pyramids and other large ceremonial structures that have now pushed the date of the earliest buildings to the end of the 4th millennium BC. Dr. Jose Oliver, who lectures in Latin American archaeology at University College London, has stated “that by 3100 BC monumental buildings were already under way, not just at an isolated site but also across a whole region”. Such structures were being erected 400 years before the earliest Egyptian pyramids! The Sechin Bajo site is now (2017) being claimed(r) as having the oldest manmade structures in the Americas and having been dated to 3500 BC. The prehistoric coastal city of Caral (3400 BC) has also revealed that quipus, the ancient South American ‘writing’ system, was in use there as early as 3000 BC. A cache of 25 well-preserved quipus were discovered in an ancient warehouse in Peru in June 2014(d). It may be worth noting that systems similar to the quipus have been indentified on Hawaii and ancient China(q). Philip Coppens gave an interesting overview of the Caral site(a). A 2016 report(j)(k) reveals further details of the level of technology achieved at Caral(o). 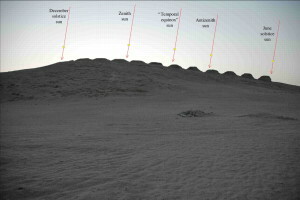 Also near Caral is Aspero (3700-2500 BC), another large pre-ceramic site(p). As early as the 16th century Agustín de Zárate identified Peruvian natives as originally having migrated from Atlantis. Ignatius Donnelly made a similar suggestion in a chapter of his book that he devoted to a description of Peru as an Atlantean colony (Pt.5 Chap.5). In the 1960’s Mrs. Karola Siebert of Lima attempted to link her own finds and other discoveries of structures and inscriptions in Peru with Atlantis. The rather tenuous links suggested were compounded with a high degree of supposition. A few years later James Bailey also opted for Peru as the site of Atlantis. In 2004, Professor Robert Benfer unearthed a structure at the Buena Vista site in Peru that was named the Temple of the Fox. This 33-foot high Andean temple revealed the earliest known astronomical alignment and sculptures in the Americas(e). 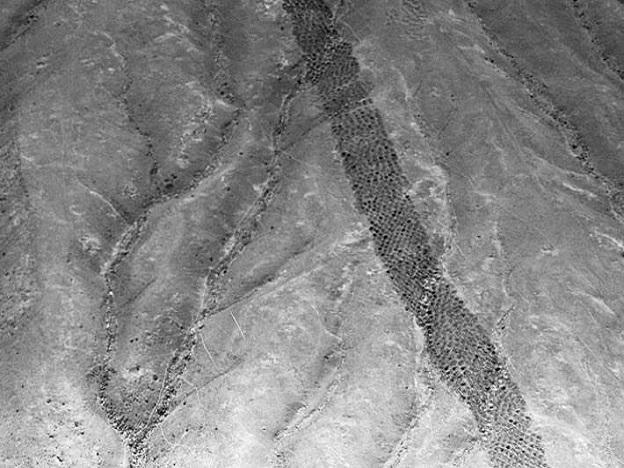 Peru also offers another rarely discussed mystery, namely, a long band of holes, numbering thousands, in the Pisco Valley, which has lead to much head-scratching among archaeologists(l). 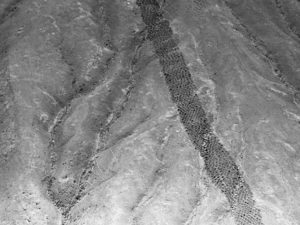 Petroglyphs dated as between 3,500 and 4,000 years old and described as an ‘astronomical laboratory’ has been discovered in northern Peru and disclosed in July 2014 in Archaeology magazine(c). The Peruvian Times have an extensive ongoing (2011) series(b) on the history and culture of Peru which is well worth a look. The Smithsonian Magazine claims that Peru was home to the oldest calendar in the New World(g), as well as the oldest solar observatory in the Americas(f), which is credited to the 4th century BC, thirteen towers of Chankillo(h)(i). It was announced in August 2016 that an intensive search from space of undiscovered archaeological sites, would begin with Peru(m)(n). (b) http://www.peruviantimes.com/23/history-of-peru-series-part-1-the-dawn-of-urbanization/6447/ Subsequent parts of this series are to be found in the History section of the Peruvian Times.